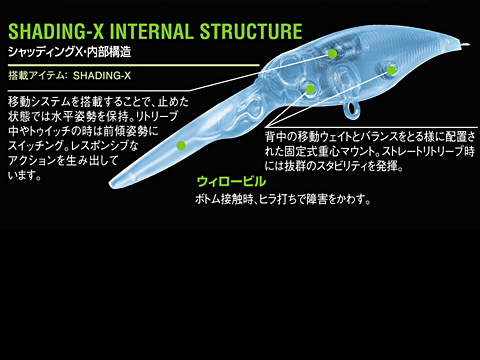 The SHADING-X's tough, slim-body design succeeds in creating realistic darting actions with ease. 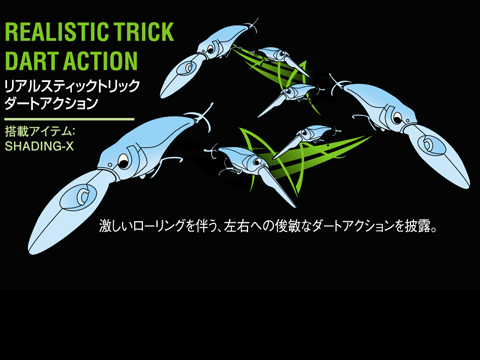 The finely-tuned combination between moving tungsten balancers along its back, and fixed center-of-balance mount along the stomach, allows SHADING-X to perfectly mimic the subtle, stable swimming characteristics of shad. 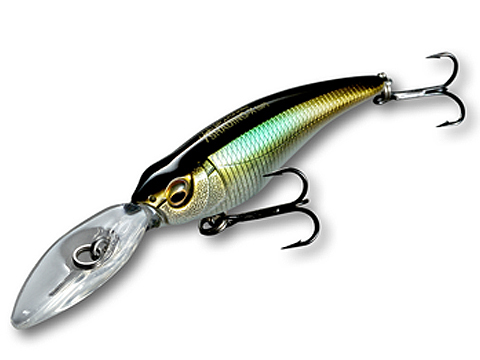 The super-slim willow bill makes sharp, super high-pitch wobbling action possible. SHADING-X displays excellent stability during straight retrieves, and skillfully evades obstacles while moving along the bottom. With the movable weight system on its back, it keeps level when paused, and reverts to a forward-leaning motion during twitching and retrieves, creating responsive movements.